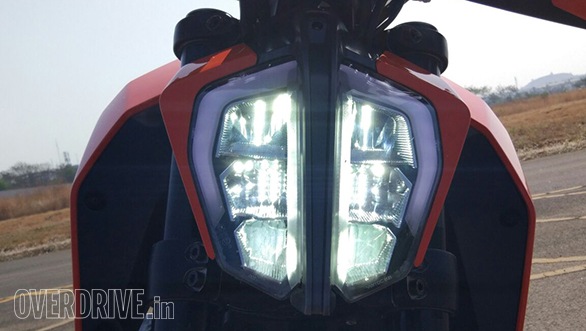 The KTM 390 Duke is a chartbuster. As far as I am concerned, it debuted at the top of the charts just under four years ago. And I would say that's where it's held sway. A motorcycle that's phenomenal in performance and handling. And priced so well that it still is unmatched by any other manufacturer. 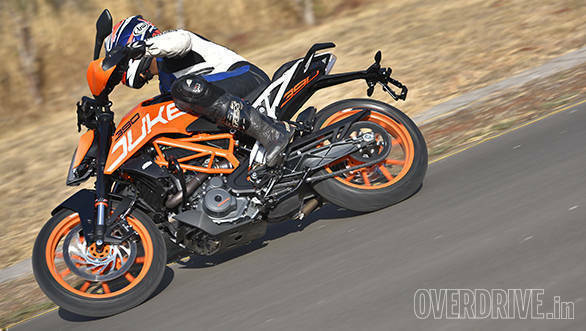 Can KTM top the 390 Duke with the new one? Let's dive right in. 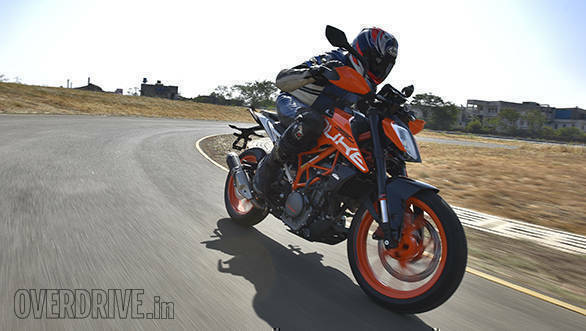 The KTM 390 Duke is the flagship of the Indian-made Duke line-up. And as such the old one was fast and effective. While the KTM 125 Duke is largely responsible for KTM's sales success in Europe, it's the 200 that's done the business here. But the desire to have a 390 has always been strong. Now KTM is changing a gear. The 200 and the 250 Duke, up to now, had the same overall equipment as the 390. Inasmuch, your extra money basically got you a larger engine with forged pistons and more performance. Not any more. 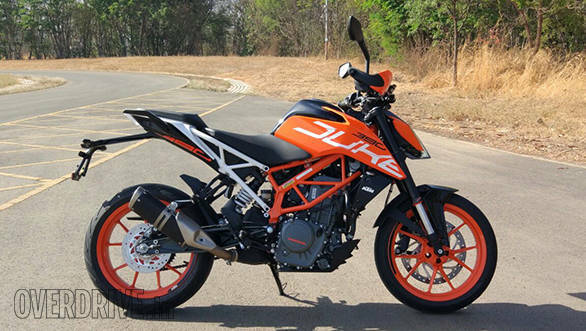 Now the KTM 390 Duke is definitely the flagship - it exclusively gets all the cool bits and it retains its performance advantage too. That's how KTM kept the 200's price (and design) steady while raising the 390's price and opening up the gap into which the 250 Duke slots. 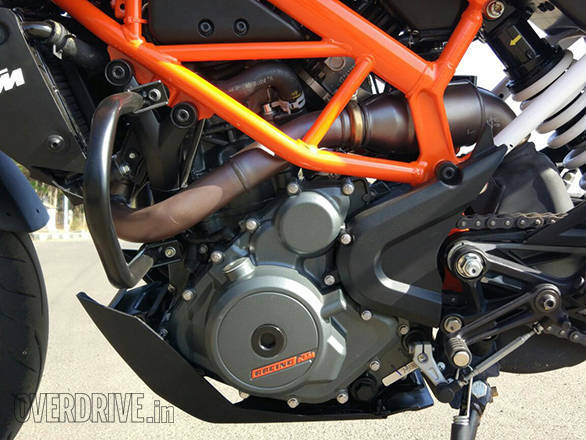 The KTM 373cc engine isn't technically new from scratch. There're numerous updates and upgrades but there are two big ones. First, this is a Euro IV-spec motor with a side-slung exhaust and ride-by-wire. The ride-by-wire's purpose is primarily emissions control but it makes the engine just a hint more crisp in response. It's noticeable but not night and day. The new 373.6cc engine doesn't change displacement but the refinement levels are unprecedented. A smooth 100kmph cruise feels lovely and the larger new airbox gives the 2017 KTM 390 Duke a full 2Nm more torque at the peak. Second, KTM has specified a bigger air box that allows them to extract an additional 2Nm in peak torque over the old 390 and 1Nm more than the 2017 RC390. The base trellis isn't new either - the steering geometry and wheelbase are unchanged. The bolt-on subframe is new but it doesn't change much for the owner. It makes KTM's life easier in terms of evolving the platform. And should you damage the subframe, it's a smaller, cheaper part to replace. On the other hand, KTM gives the 390 new open cartridge front forks. They trade in 8mm of travel but they're vastly more sophisticated than the outgoing units in the ability to handle small bumps. It's rather obvious that the forks feel a lot more controlled under almost every condition. The rear shock looks visually similar but is a new unit with a different tune too, and it matches the new forks step for step. Also new is the front brake which is a 320mm rotor with ABS. 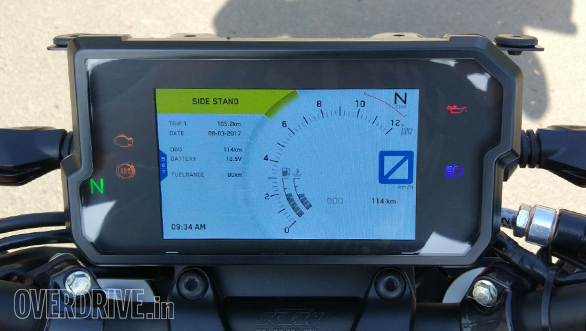 The ABS can be turned off from a menu and you also have the option of turning off ABS only on the rear wheel, a mode KTM calls 'Sup Mot' a rather cryptic abbreviation for supermotard. On both sides of the screen are the telltale lights, and the top right is a daylight sensor that tells the screen whether to use day or night mode. All of the rest of the magic is in the screen, as it were. The TFT colour screen looks smart. A light sensor on the top right allows the screen to switch between night and day modes. If the DRL mode is on, it will also turn on the low beam when it detects darkness, like say a tunnel. However, KTM has given this an 8 second delay which might be too long. The main screen on the right shows the revs, gear selection, odo and speed. The fonts on the speedo enlarge as the pace rises to ensure visibility. On the left is the information display including this one - favourites. Favourites allows you to select up to eight items you'd like to monitor. 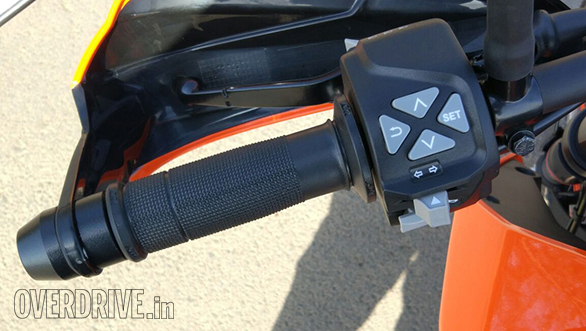 The My KTM feature allows you to pair and control calls and music on compatible cellphones. The main panel is on the right and it shows you the odometer, numeric speedometer, gear and revs. 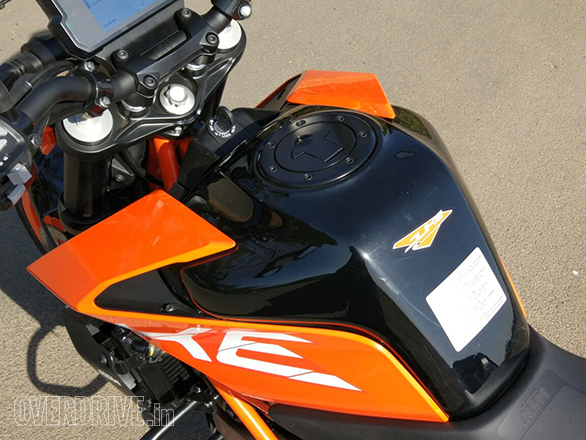 The KTM increases the font size with speed for legibility. The colour of the rev counter goes red as a shift light. The left side of the panel is where all the additional information is. The favourite selection allows you to select and place as many as eight items for quick reference. A yellow band on top has warnings and a red band at the bottom appears with critical error messages. A four-button cluster on the left grips helps you navigate the menus and the up-and-down buttons function as shortcuts on the home screen for any two functions you choose. The standard My KTM system allows you to pair and control a phone over Bluetooth. The screen shows incoming callers and music information if the phone is compatible. Frikkin' fantastic! The engine is now smooth and refined quite unlike the outgoing engine. And it makes a huge difference. The KTM engine feels like it revs a smidge slower than the old one. But progress is effortless and you can immediately sense both the composure and the extra torque. Cruising at mid-revs is easy and rolling on produces strong acceleration. But unlike the 250 Duke, for example, this is without any change in the top end. The 43.5PS arrive strong and fierce but with an extra refinement. I saw 163kmph on the digital speedo readout before braking for the fast uphill right-hander that ends the Bajaj test track at Chakan. What this means is that the 390 has a robust mid range with a lovely top end. Wonderful! Although KTM doesn't explicitly claim this, the taller gearing and the ability to run faster at lower revs should show a small improvement in economy despite the 5kg weight gain. The ride quality is hard to judge at this track but the promise is delicious. There is a controlled suppleness to the suspension which feels very nice, almost plush. It removes the jittery feel of the old one and makes life easier. The control levels over the chassis overall seem definitely improved and that's rather welcome. Because in the corners the KTM is grippy, stable and composed. The edgy feel of the 390 remains but the bike never misbehaves. The grippy Metzelers and the vastly improved suspension means that big lean angles come easy and rider confidence is higher than what the old 390 would give you. The old 390 is responsive and fast. This one will certainly outperform that in every part of the corner. That's truly impressive. 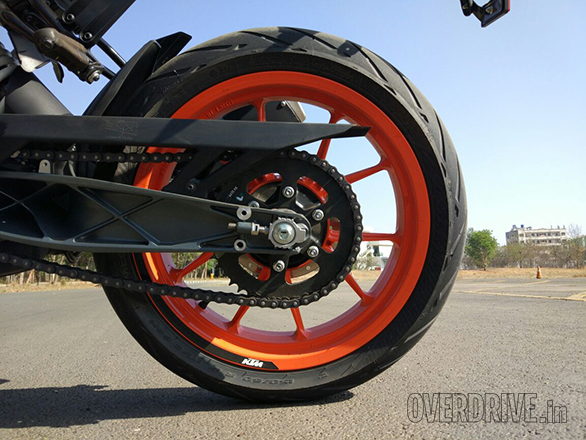 The 2017 KTM 390 Duke gets the new 320mm rotor setup that we saw on the 2017 KTM RC390 first. 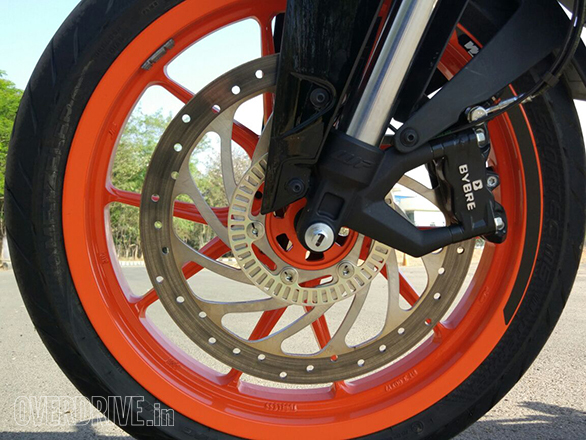 ABS is standard and braking is now strong and powerful and hence in sync with the rest of the motorcycle. The brakes were the weak spot on the old 390, and this one has that problem licked. The new 320mm rotors have strong bite and lots of power, and they do not require the extraordinary lever effort like either the 200 or 250 Dukes. 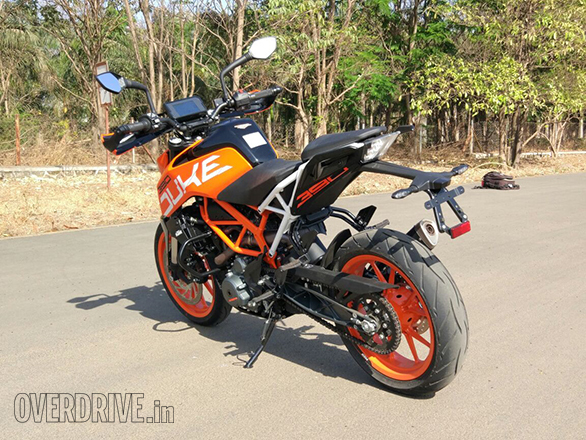 The old KTM 390 Duke outperformed its spec sheet as it were. It felt powerful, capable and, for the money, stunning. The new one is definitely a vastly improved, sharpened motorcycle. It will outperform the old one while flaunting its better refinement and brakes. The riding position is slightly more aggressive with rear - and higher-set footpegs but this is also a vastly more spacious and comfortable-feeling motorcycle. I do like the floating feel because the screen more or less disappears under the helmet as you ride. There are niggles though. First, you're going to need a screen of some sort. The wind blast past 120-130kmph is considerable and if you're out touring - something the 13.5-litre tank will support - you're going to need some help with the wind. Second, the screen looks cool but the navigation is slightly messy. It's not a deal-breaker by any stretch of the imagination, but simplicity the menu layout isn't. Third, I haven't spoken about the design because we already did on the 250 and it looks great. However, the wide box for the TFT screen and the low-mounted LED headlamp leave an odd-looking gap above the headlight that bothers me. I assume a screen or a set of auxiliary LED driving lights will handily fill the space but there it is. That leaves the raised price - Rs 2.25 lakh, ex-Delhi. I would say pay it no mind. The old 390 Duke is a spectacular motorcycle even by the standard of everything that's come after it. And I'm convinced that the new 390 improves upon it in every conceivable way. What's lost is the raw-ness of the old motorcycle that's traded in for the refinement and maturity of the new one. But I promise you, I've never ridden a 390 Duke as hard as I rode the 2017 model at Bajaj's track and I came back chuffed, happy and most importantly, it felt natural and confident rather than like I was pushing my luck. That's a big, big tick in my book. 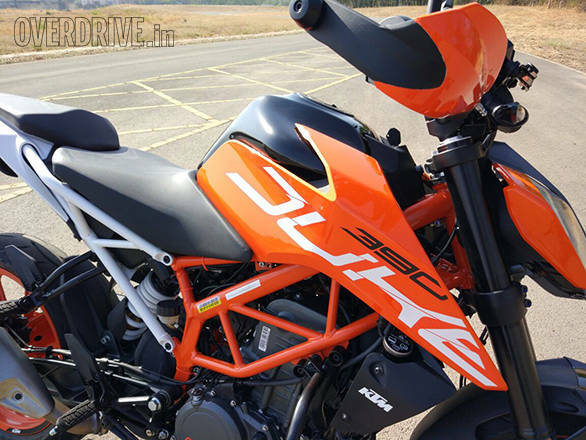 The new KTM 390 Duke is a special little motorcycle. And more people than ever are going to like it. Well done, KTM!